I'm trying to connect to my school's eduroam on Gentoo.I'm using systemd and kernel 4.2. If I try with NetworkManager, it waits like 30 seconds and then says my password is wrong. 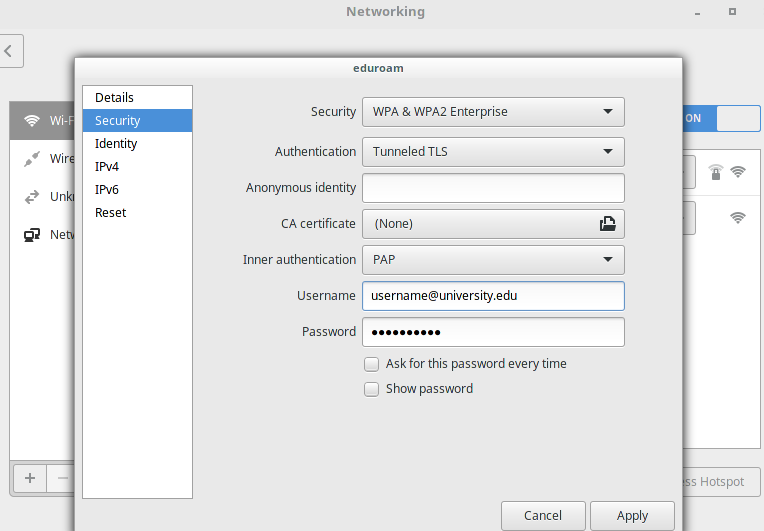 If I try with wpa_supplicant/wpa_gui, it gets stuck at 4-Way Handshale and eventually just keeps retrying. If I use NetworkManager on Mint, with the exact same settings, it connects instantly. I'm currently using the unencrypted wifi which is very bad. Here is my school's info. These exact settings work on Mint. I'll take absolutely any ideas.